Last year, A.S. Peterson surprised us all with the story of Phinea Button, aka Fin, the orphaned girl whose personal battle for independence took her away from the known land of Georgia and the man she loved to the open call of the sea. And while it was never easy, she was at least living life on terms of her own. The Fiddler's Gun left us in a place of upheaval and Fiddler's Green picks up Fin's story there. Wanted by both the British and American governments, Fin's choices are few. Still regarded as captain by her loyal men, when the U.S. government makes her an offer that will grant her a full pardon in exchange for a daring mission to rescue a kidnapped noblewoman, Fin can't refuse. With her limited experience, she takes the lives of many men into her care and sets off. What follows is the stuff the very best of adventure stories are made of...action, sacrifice, longing, love, and loss. Many of the beloved characters from The Fiddler's Gun are back and some new characters are introduced, Dr. Thigham in particular brings some much needed levity to the narrative. We are spared none of the details of war or life at sea, and not everything is painted with a rosy picture. There is suffering, death, destruction and loss. There are painful unexpected consequences. But always at the heart of this pain and sorrow there is hope and the promise to take it all and turn it into beauty, as Fin does again and again on her fiddle. Peterson's emotionally charged prose invites us straight into the heart of Fin. I started reading and could not set this book down until I'd turned the last page. I loved escaping into the world so vividly drawn on the page and invested my heart in Fin's journey. And while it was certainly painful, upon finishing the book I felt that deep heart satisfaction that only a really great story can bring. 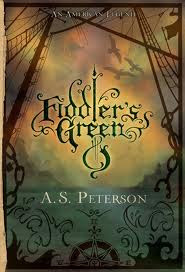 Fiddler's Green is a rich, layered tale of personal independence set against the backdrop of the American War for Independence. Beautifully written, emotionally heartwrenching, and deeply satisfying. Fans of The Fiddler's Gun who have been longing to read the conclusion to Fin's journey will be delighted to the discover this sequel far outweighs expectation in every way. Other Links of Interest: My Review of The Fiddler's Gun, interview with A.S. Peterson, Underground Lit Society Round Table Discussion on Writing the Opposite Gender with A.S. Peterson, The Fiddler's Gun website. Support indie presses and indie bookstores--buy the book at the Rabbit Room Store.